Ebsworth Street is an ambitious Modern Image 00 layout for the exhibition circuit. The track layout is designed for the signalling and operation side. 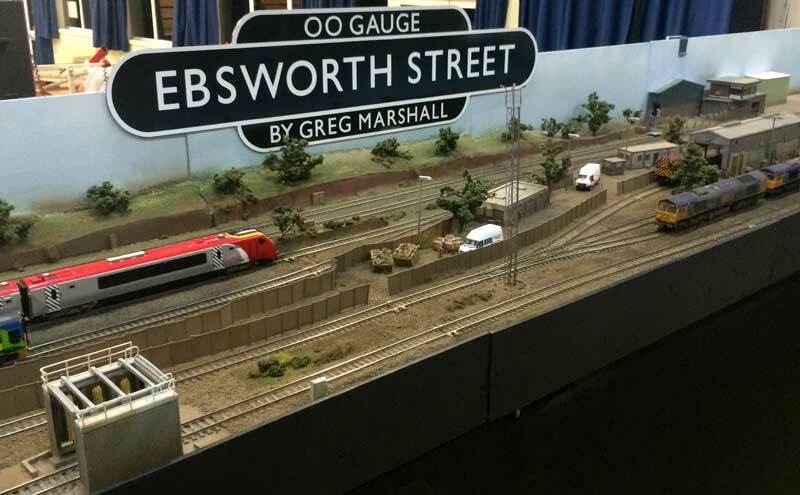 Ebsworth Street recreates a small main line terminus station with 3 platforms running from London via the main line. It’s a busy station with a main road leading to town centre. Plus there is a train care depot with loco sidings and re-fuelling point/stabling point with working yards lights, working colour light signals and ground shunts. Plus interesting scene features The layout is DCC operated by Lenz 100 system with DCC fitted sound locos/Units. 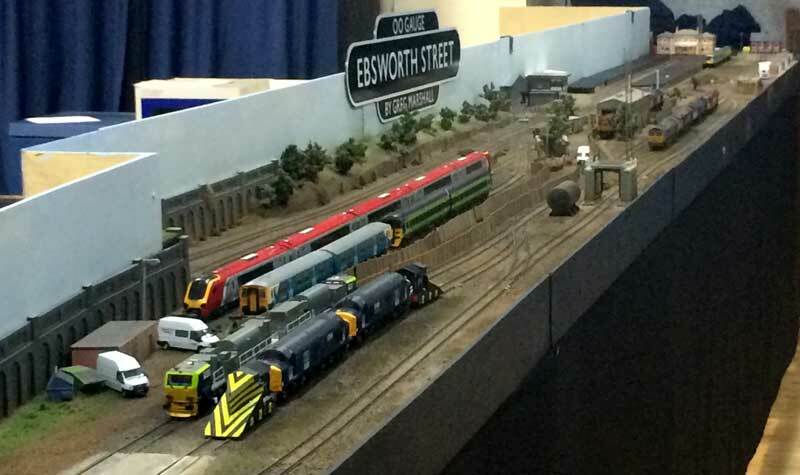 The idea come from taking the best of layouts I seen and operated over the years whilst Chairman of Beckenham & West Wickham Model Railway Club, and working within the S&T for Network Rail at Waterloo. Plus working for Model Zone/ The Signal Box for just over 7 years and now helping out at Invicta Model Rail (Sidcup). I had been to many shows all over the UK with them. From that I decided its time to build my own layout. Space was limited at first both at home and for transporting the layout to shows. The first plan was for an 8ft by 2ft Diesel depot for locos, but I have a liking for Voyagers, HST’s and Units. Once I sat down and talked to Paul then said “what about this?.” So with that in mind. The layout becomes 26ft by 4ft. with each baseboard 2ft by 4ft. With the space in my Ford S Max Sport we had to make some changes to get it to fit in. So we paired six 2ft by 4ft boards in to three pairs and that had to be 45” wide to fit in the back of the car. That left one pair to be cut in to 2ft by 2ft boards and paired together. After getting the layout home it was time to set up the boards in the garage for corking and then track laying. Over the years I could say that my track lying was bad, but if you don’t try you will not get any better and helping with the rebuilding of Horton and track laying on Beckwick I have improved. I had a plan in my head so I put pen to paper and then went shopping for points and track. I included sixteen houses a signal box, office blocks and accessories that I had been buying for many years to finally put on my layout that was coming along nicely. Once I had been shopping I started recreating the paper plan. After discussion with Paul and other club members it started to come along nicely. With the plan for the station and yard completed on paper it was time to mark out and see how it looked. Laying the junction to the station and the entrance to yard all had to be right. I had got it down and it looked great. Track lying was fun and the more I did it the more I was working on the layout in my spare time. Apart from working on Horton on club nights. The layout was growing faster and faster day-by-day. After I had laid a large amount of track, I had to think what I am going to use over the board joints to align the track. When building the boards I had put in alignment dowels to keep it level, but that doesn’t always guarantee the alignment of the track across the boards. Having used different methods in the past, this time I started off by cutting away the sleeper edge to drill a hole for screws to go in as close to the rail as possible. I then soldered the track to the screws to hold it in place. At first it stands out a lot but when I sprayed the track it’s not that bad. Back to track lying in the yard and carriage siding. Five months have passed and now Ebsworth Street has had wiring and extra scene and detail work completed. I have decided to go down the same route as Horton using MRCCC to control the layout and Signals/Points. I have kept the wiring simple, so anyone can look underneath of the baseboards to see what’s going on and where it’s going. I have soldered black wire to public viewing side and red wire to the operator side. All this came about after helping with the wiring up of Horton after its rebuild, which showed up some problems when we were fault finding. With 37 core cables on each base board it was hard to place a meter on and get a voltage reading. So Paul had another idea on how to make it easier to fault find on my layout by using PCB with the two wires soldered to it and an insulating cut between them placed underneath the track block joint. Then wires from the PCB to the 37 way cable with plugs to connect the baseboards up together. I have five baseboards wiring and mostly scenery completed. Signals and Shunts are still to be installed and tested. If you have been visiting the clubrooms you will have seen about 8ft-12ft. that has been wired and scened. With Horton not up this has kept me active and shows new members what you can do and learn from the club. I have only just started working on the platform area, marking out with paper and then with a pencil on the side of a MK3 Coach in the middle and let the pencil do the work for me marking the platform edge for clearance. That will give me the base for the platforms – 12mm MFD will be the base for it. Next will be to place them on the layout and see how they fit and any sanding down or cutting away can then be done for board joints and point work. Once I have done that I will use the Metcalfe station kit for the brickwork which will save making or cutting brick paper. For the top of the station platforms I will use 1.5mm Plywood using the base of the platforms to mark out the top on the 1.5mm on plywood to give me the right height to coach’s steps. I hope Ebsworth Street will continue progress and be apart of exhibition circuit to promote the club and show what we have to offer as a club and our layouts. If you have a personal project going on at home and you need some help, or to show what you have done, then feel free to bring it down to the club. Picture can be found on flickr.